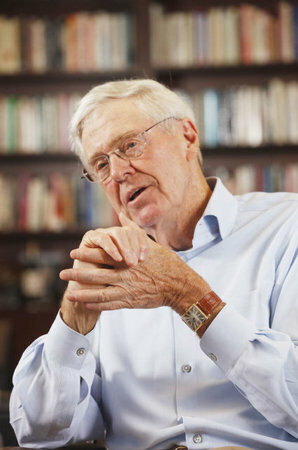 Charles de Ganahl Koch was born on the 1st November 1935, in Wichita, Kansas, USA, of part-Dutch descent. He is a very well known business tycoon, and philanthropist, the CEO and chairman of multinational corporation Koch Industries, which he co-owns with his brother David H. Koch who takes the position of Executive Vice President. Their company, inherited from their father, is now the second largest non-publicly traded company on the US stock market. How rich is the owner of one of the largest companies located in USA? It has been reported authoritatively that the outright size of Charles Koch net worth is over $44 billion, as of the data January 2016, which places Charles Koch inside the top 10 list of the richest people in the world. Charles Koch graduated with a Bachelor of Science in general engineering from the esteemed Massachusetts Institute of Technology in 1957, then continuing postgraduate studies earning his two Master of Science degrees in mechanical engineering (1958) and another in chemical engineering (1960). In 1961, he joined his father Fred C. Koch’s business – Rock Island Oil and Refining Company. In 1967, the brothers inherited the business, and subsequently multiplied the financial weight of 2600 times its original size as a result increasing the net worth of Charles Koch and his brother. Basically, Koch Industries specializes in oil refining and chemicals, extending to petroleum products (polymers, textile fibres, fertilizers), equipment and technologies industry (maintenance, pollution control) to commercial transactions services and various other consumer areas (forest and livestock products). What has become a conglomerate combines their retail brands such as Stainmaster (carpets), Lycra (fiber), Quilted Northern (paper towel) and Dixie (stationery). More, the Koch brothers also own Koch Family Foundations, which are a great source of funds for some conservative political causes. David is involved in politics, and was a candidate for the vice presidency for the Libertarian Party in 1980, although finishing 4th. In April 2006, it was announced that the Koch Family Foundations had donated $ 1 million to help preserve the tall grass prairie part of the Tall Grass Prairie National Preserve in Chase County, Kansas. The above mentioned donation is the largest private donation in the state’s history. It is worth mentioning that Charles Koch considers himself to be a classical liberal. He judges the presidency of George W. Bush bad. In the latter, he prefers the figures of George Washington, Grover Cleveland and Calvin Coolidge. Charles Koch would prefer to minimize the role of government and maximize that of the private economy and individual freedom. During his long spanned career in business, Charles Koch has received many awards including Honorary Doctor of Science, from George Mason University, for his continued support of the economics program at GMU, The Entrepreneurial Leadership Award from the National Foundation for Teaching Entrepreneurship, The Individual Recognition Award from the Wichita/Sedgwick County Arts and Humanities Council and many others. In 2011, Charles and David Koch have been inducted into the list of the most influential people by Time magazine. Finally, in the personal life of the business tycoon, he married Liz Koch in 1972., and they have two children: Chase and Elizabeth. 1 Along with David H. Koch, one of Time's 100 Most Influential People in the World. [April 2014].